Café au Go Go opened in February 1964 in the basement of 152 Bleecker Street and provided a stage for many of the greatest rock, jazz, folk and stand-up comedy performers of their era. A list of venue regulars reads like a who’s-who of the New York art and pop scene of the time: Van Morrison, Jefferson Airplane, Oscar Brown Jr., Judy Collins, George Carlin, Linda Ronstadt, Richie Havens, Muddy Waters, Odetta, Richard Pryor and Stan Getz. The Café set the stage for the first New York performance of The Grateful Dead, hosted Jimi Hendrix and is indelibly linked to the infamous obscenity arrest of Lenny Bruce following his shows at the club. It’s the 50th anniversary of legendary (and long-closed) Village club Café au Go Go and the Greenwich House is celebrating with a series called “The Café au Go Go Revisited.” The full schedule of events is below but Thursday (5/6) at the Greenwich House is Eli “Paperboy” Reed with onetime Carolina Chocolate Drops member Dom Flemons. Tickets for that show are on sale now. 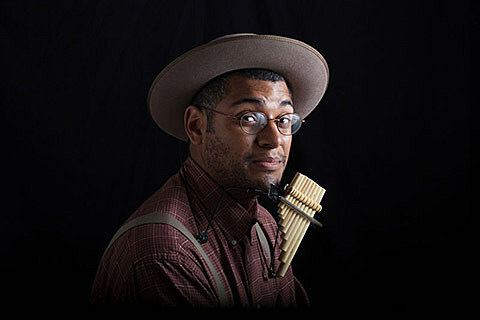 Flemons’ appearance is in the midst of his current tour with Reverend Payton’s Big Damn Band. He’ll be back in the NYC area for the Brooklyn Folk Festival in April. All Dom Flemons dates and ” Café au Go Go Revisited Music Series” schedule are listed below.